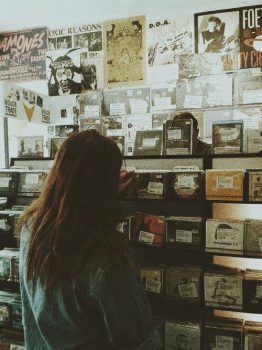 Ever been in a record store? I had my first visit to one this weekend. The store seemed welcoming to all interested in music of all kinds with floor to ceiling front windows and a huge sign reading, “Reckless Records.” I described the experience to my friend as calming and comfortable. In fact, that’s how I felt a nywhere in Wicker Park. The neighborhood is filled with small, locally owned businesses ranging from thrift stores, themed cafes, and book shops. Not that the rest of the city hasn’t welcomed me, but I felt as if I could fit in even more in this neighborhood. Prior to my stroll through Wicker Park, I got to experience a great tradition involving Saint Patrick’s Day and Lake Michigan. Yes, I watched, along with hundreds of others, as they dyed the lake bright green in honor of the holiday. I don’t want to seem pretentious, but I think I’ve gotten a pretty good grasp on deciphering between locals and tourists. Especially this weekend. I did not realize how many people travel here for spring break and holidays, but I definitely have a better understanding on that number now. I used to be a tourist and took a moment to realize I kind of miss it. However, it’s great to actually know where I’m going and which direction I need to go in to get there! As for my internship, things are going smoothly. I’m still working on getting collaborations going. I’ve gotten traction on a few, but still seem to be hitting some speed bumps. Oddly enough, I try not to mention that I am an intern because of the ranking that puts me in for most professionals. 32 hours per week dedicated to making phone calls, typing emails, and having meetings has gotten me many places, though. Again, it’s all about the grind and dedication!